SAF-T-EZE® High-Temp Bearing Lubricant is a multi-purpose high performance Bentone thickened grease that exhibits superior high temperature stability to as high as 1000ºF (538ºC) for intermittent use. This grease has been compounded for high as well as low speed bearings and includes finely divided graphite particles for enhanced lubricating performance. It includes additives to resist water wash-out and contains corrosion inhibitors to prevent rust promotion. High-Temp Bearing Lubricant is a multi-purpose high performance Bentone thickened grease that exhibits superior high temperature stability to as high as 1000ºF for intermittent use. This grease has been compounded for high as well as low speed bearings and includes finely divided graphite particles for enhanced lubricating performance. It includes additives to resist water wash-out and contains corrosion inhibitors to prevent rust promotion. Red Bearing Lubricant is a multi-purpose high performance Polyurea thickened grease that exhibits superior high temperature stability to as high as 350ºF for intermittent use. This grease has been compounded for high as well as low speed bearings and provides 70% longer service than conventional greases. It includes additives to resist water wash-out and contains corrosion inhibitors to prevent rust promotion. 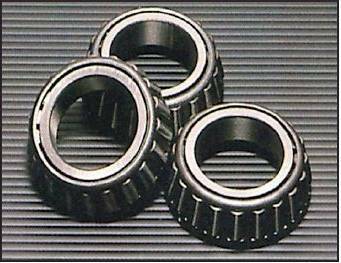 EP Bearing Lubricant is a multi-purpose high performance lithium soap thickened grease that exhibits extreme pressure characteristics and superior temperature stability to as high as 360ºF for intermittent use. This grease has been compounded for high as well as low speed bearings. It includes additives to resist water wash-out and contains corrosion inhibitors to prevent rust promotion. This is a silicone fluid thickened with inert silica filler that exhibits temperature stability to as high as 450ºF for intermittent use. This grease has been compounded to be non-melting, moisture resistant and low volatile. Primary uses include release and parting agent, electrical insulator and sealant, rubber and plastic lubricant or protective coating and valve lubricant. This is a silicone fluid thickened with inert silica filler that exhibits superior di-electric properties as well as high temperature stability to as high as 450ºF for intermittent use. This grease has been compounded to be non-melting, moisture resistant and low volatile. Primary uses include release and parting agent, electrical insulator and sealant, rubber and plastic lubricant or protective coating and valve lubricant. 30 HRS. @ 212ºF: 6 MAX.